This section includes a special genre of fantasies that make abundant use of mushrooms to emphasize how close the world of fairies is to that of the mushrooms. Reference: Carove, Friedrich Wilhelm and Austin, Sarah. The Story without an End. Columbia, SC: Camden House. 1995. Note: Originally published in German in 1930. Sarah Austin has translated the edition listed here, the most recent translation. Medium: Pen, ink, and watercolor; size: 26.8 x 42 cm. 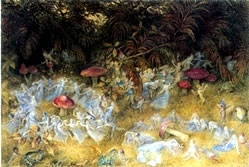 Reference: Woods, C. Fairies in Victorian Art. Woodbridge, U.K.: Antique Coll. Club. 2000. Medium: Oils on canvas; size: approximately 23 X 23 in. Note: Puck sitting on a toadstool originated with Sir Joshua Reynolds, who also painted a Puck for Boydell's Shakespeare Gallery. Medium: Oils on oval canvas; size: 61 x 75.5 cm. Medium: Watercolors; size: 19.7 x 29.0 cm. Location: Oldham Art Gallery, Lancashire, UK. Medium: Engraving; size: 27.5 x 38 cm. Medium: Illustration in watercolors; size: 37 x 29 cm. Medium: Pencil and watercolors; size: 48.8 x 32.2 cm. Medium: Watercolors on paper; size: 35.30 x 27.5 cm. Medium: Oils on canvas; size: 19.7 x 27 cm. Medium: Oil on canvas; size: 19.7 x 27 cm. Location: City Art Gallery, Birmingham, UK. Reference: Betthausen. Die Präraffaeliten. Berlin. 1989. Ichuko, Azuma Higashi. Japanese, active 1984. Medium: Unknown; size: 44.2 x 32 cm. Medium: Pen and ink, watercolors with gouache on paper; size: 21.6 x 30 cm. Medium: Ink and watercolor on paper; size: 24.8 x 18.6 cm. Medium: Oils on panel; size: 29.8 x 22.8 cm. Medium: Oil on board; size: 17.7 x 5.2 cm. Medium: Watercolor with white heightening on paper; size: 15.5 x 23 cm. Medium: Oils on card; size: 24.2 x 28 cm. Medium: Oils on canvas; size: 90.5 x 146.7 cm. Reynolds, Sir Joshua. British. Plympton 1723-London 1792. Medium: Watercolor on paper; size: 32.5 x 23.5 cm. 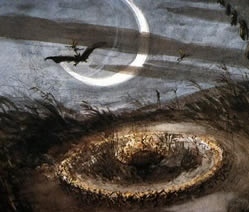 Medium: Watercolor; size: 49.2 x 61.8 cm. Mushroom description (by J. M. Toohey): "A group of perhaps six perhaps mushrooms in the lower left-hand corner, next to a stump with assorted foliage about. Lactarius? Short stipes, convex to sunken caps with inrolled margins on some, and gills may be attached, reddish-brown tones, that did not seem typical, artist's prerogative, I suspect."